It’s better not to rely on the compass rose on this otherwise helpful sign. “East is East, and West is West, and never the twain shall meet”? 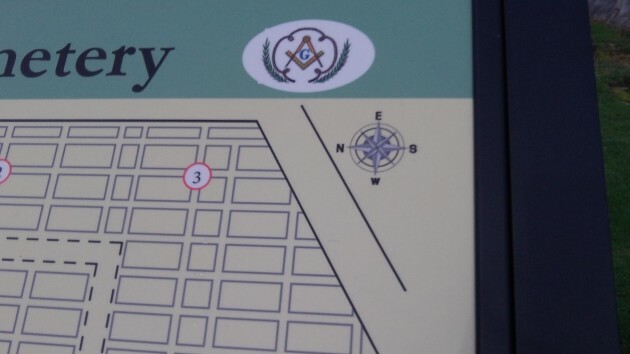 Maybe so, but Rudyard Kipling never visited Albany’s Masonic Cemetery, where east is west and west is east, and a visitor relying on the sign may get easily confused. That tall monument back there marks Delazon’s grave. the logo with pointers is accurate. the map is laid out with north being on the left. that allows to map to have a shape that fits the prescribed sign dimensions. Looks to me like the “compass” on the sign only needs to be turned 1/4 turn clockwise. The whole sign should be rotated CCW 1/4 turn and then the “compass” rotated 180 degrees. Interesting comments. I had hoped that nobody would notice for a few months while we try to figure out a “good” fix for the compass. One of our grant folks put the compass in w/o checking with the rest of us, unfortunately. I suppose the main point of the sign, however, is that the cemetery needed some identity–first as a Masonic cemetery (since folks today don’t know what the symbols are on the brick fence entrances), and second–as an historic cemetery with some interesting locals buried there. As a side note, it would have been easier to orient the sign east and west, but there are folks buried in private plots, and we could find only a narrow strip which oriented north and south next to the main gate. 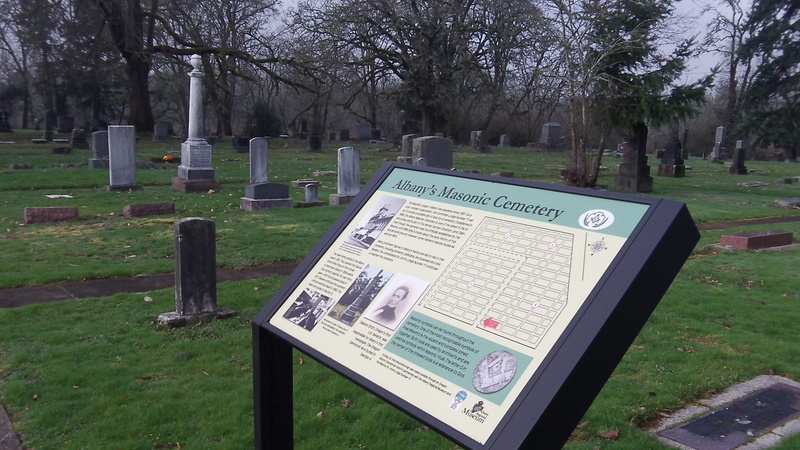 Yes, taking on these projects can ben “thankless” at times, but the OR historic cemeteries grant people were a major help in getting us the signage. We’ll try to fix the compass orientation soon! Looks like the “Salem clique” got back at the Albanians. I see the sign was funded by an Oregon State Parks / Historical Cemetery grant. Must’a’ been them, as I’m sure the Albany Regional Museum knows which way is North.